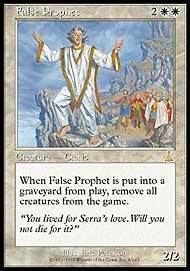 When False Prophet is put into a graveyard from play, remove all creatures from the game. Virtually any sweeper is gonna be played in Limited. With such a heavy focus on creatures in Limited there's never a time where you'll wish you didn't have removal. Constructed is a whole other story since you could run into a deck playing no creatures. Also, there are much better sweeper options than the Prophet in constructed like Wrath of God, Rout, etc. The artwork is neat though. Honestly, I think the card is great in limited. It's almost like have a creature with some sort of evasion ability, because many times they won't block it. Unless they are willing tot ake the trade of course (which should be fine for you). Prophet Rating: This guy probably talks to Elvis next to the bright light. I used this guy in my PT Draft deck at my first Pro Tour, 3-0 at my second table. He has a place in some decks, but his scope is very limited. In limited he's a Wrath-effect and this makes him an amazing card. False Prophet is one card that I might not mind opening in draft. It is a creature that can make the game grind to a halt if played right, or let you go on the offensive with evasion critters instead of having them held back to block. In constructed, it's not quite as good with things like Wrath of God or Rout around, but could be useful since Threshold might be used a lot in your area. The only reason I rated it this high is that I very much enjoy mass destruction spells. Gerhardt False Prophet is scary. He's white, which is appropriate since he's the town leper once on the board - no one wants to even touch him. In my opinion, he's a lot better than the amount of play he got when he was legal. Especially with a multitude of ways of sacrificing creatures at instant speed, what you have here is a way of going one step better than a Wrath of God at instant speed. Great to counter the re-animators as well since it removes the creatures from the game. It's not that poorly cost, and can even swing for a few if it needs to. I could see it coming in out of boards in extended as well to fight several deck type with reanimating creatures, or even Morphling and stuff like that which is hard to handle. In limited, he's crazy. Play him right and you're almost sure to win. A definite high choice. Hornberg I am very very bias to this card because it is my favorite card over all. To see why, you need not look farther than my screen name on the board - The Happy Heretic. 'Nuf Said on that. Still, this card is actually a pretty decent card. In constructed, it has the potential to ruin an opponents offensive build up of creatures, simply by chump blocking. I see this card being used more in control as an extra board clearer, and not in beat down because you lose about as much as your opponent. So, in constructed, with my bias rating, and everything weighed, he gets a 4.5 (really a 3 if you leave off my love of the card). In limited, like all board clearing cards (Wrath of God, Rout, Kirtar's Wrath, Winds of Wrath, etc. ), this guy is a first pick. In draft, even if you're not playing white, you have too much to lose from letting this go, and someone will play it. This card will not come back in draft, it should go between the first two picks, because it is a "Wrath of God." In sealed, he has the potential to change the game, and should be in most decks. In limited, an out and out 5, no questions asked. Peatross False Prophet basically says "attack at your own risk". I've seen him just shut the game down for awhile... to a slow crawl. 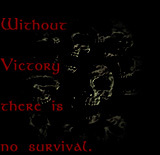 Nobody wants to sweep the board until they're ready to replace everything lost, or until they can attack for the kill. Of course any way to sacrifice the Prophet makes things even worse, because they don't have to take any damage - just wait for you to send it, then sacrifice making you out to be the fool. As for constructed, he's got his place in a few decks, filling a very interesting specialized role. I like him in Prison style decks, where he can not only attack once you've locked them down, but he also serves an additional Wrath of God to keep things under control.